On your wedding day, you deserve to look your best. 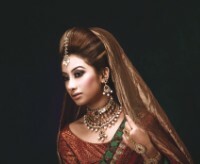 To help new brides look their most radiant, Farzana Shakil's Makeover Salon Ltd is offering Bridal Package from November 15, 2011 January 31, 2012. The famed salon has a wide range of bridal packages for all tastes and budgets. The offers include the best bridal packages with lots of free services for brides and their associates, like free pre-bridal services and free make-up for accompanying persons. Select the bridal package best suited to you. For additional information please contact 9116057 (Dhanmondi) & 8812172 (Gulshan) or visit the salons. Hues, textures, tones, lots of skill and genuine concern; these are some of the tools which pitched Prito Reza to the top of the wedding photography industry. After five years of making dreams last on paper, five years of capturing that hidden smile or that wide-eyed wonder, five years of delivering beautiful memories at doorsteps, Wedding Diary, the country's leading photography firm led by Prito Reza has organised a nine day-long exhibition at Drik Gallery titled 'Wedding Diary - An exhibition of wedding essentials' to celebrate its 5th anniversary and to reveal itself as a complete event planner. True to its title, the exhibition showcases a wide range of wedding event essentials, from backdrops to decoration pieces to exclusive wedding videos and of course photographs. Not displayed but yet available in abundance are the out-of-box ideas this team of wedding planners are ready to offer. The team consists of professional photographers, cinematographers, thematic and floral designing teams and event management experts all standing ready to ensure that even the minutest detail of your special day does not go amiss. Wedding Diary promises to be a one-stop solution for a grand wedding event management. They are ready with exclusively referred caterers, lighting companies, floral designers and bakers, hence shouldering your burdens and making it easy for you to share your day with those you love. In wedding photography they follow four distinct styles. Photojournalistic uses storytelling through images, Artistic stylises images of you, your guests and the wedding environment, Traditional takes formal portraits of you and your loved ones and Illustrative takes all the decorative and stylish details of your event. “In doing wedding photography we use a calm and personal approach to ensure that we are not invasive,” Prito Reza stresses. In wedding filming they look into details, using advanced camera and skilled film/TV industry cameramen. Angles and details are specially looked into so that nothing is missed and a videographer editing team pours over your film to deliver a colourful and dynamic wedding memory on reel. The wedding season is just around the corner and such an exhibition is what every bride and groom to-be needs to keep the idea wheel rolling. With 5 years of observing hundreds of weddings, Prito Reza is perhaps one of the most adept people for the job he has undertaken. The exhibition is also conducting a raffle draw where a lucky couple wins a free wedding! Wouldn't you like to put your name in? The world's favourite franchise restaurant KFC has never fallen short of delighting finger lickin' lovers across Bangladesh with their mouth-watering dishes and innovative eating experiences. And now, they have taken things a step further by launching their newest outlet at a place that can easily be called Bangladesh's favourite tourist destination, Cox's Bazaar, and another in the thriving Uttara. These new outlets make up an impressive total of 11 outlets across the country including 9 in Dhaka, 1 in Chittagong and now 1 in Cox's Bazaar. KFC's ever-expanding network of finger lickin' goodness is all part of their vision to one day delight the entire nation with the colonel's recipes. “Cox's Bazaar makes it 10. Also, it makes us proud to be the first international brand in Cox's Bazaar -- a place known worldwide. Our vision is to be the highest quality of quick serving experience in Bangladesh, where friends and family can enjoy a great tasting recipe at affordable prices. I ensure the food lovers will enjoy our 11 secret spices recipe, first-rated services and overall outstanding dining experience,” said Akku Chowdhury, Managing Director & CEO, Transcom Foods Ltd adding that the launch of the 2 outlets (Pizza Hut and KFC) in Uttara makes it their 11th outlet. As part of KFC's campaign to give back to its community, a recent partnership with the Bangladesh Football Federation has yielded a new program. From this year, KFC will be sponsoring the Women's Super League football tournament; the teams were invited to the grand opening at Uttara. Those who love the Peri Peri taste, but don't always have the time or energy to brave the Dhaka traffic, are in for a treat. On November 11 Nando's launched their home delivery service for the first time in Bangladesh. "Starting a home delivery service from Nando's was a dream that I had and now I am turning it into a reality to further add value to our customer's experience,” says Mr. Ahmed Abu Insaf, COO Nando's Bangladesh. Nando's pulled out all the stops on launch day; all the home delivery orders were delivered in a Mercedes Benz which was escorted by two motorbikes sporting the Nando's flag. There are currently two Nando's outlets in Dhaka and they are delivering the famous Peri Peri Chicken to the residents of guests who will be ordering Home Delivery. Currently, Nando's is providing Home Delivery in the neighbouring areas of the restaurant. They are calling these locations 'Hot Zones'. The 'Hot Zones' around Nando's Gulshan are Gulshan 1, Gulshan 2, Baridhara and Banani. The 'Hot Zones' around Nando's Dhanmondi are Lalmatia and Dhanmondi. Nando's Home Delivery service can be availed everyday between 12 pm to 10 pm. The Home Delivery will be absolutely free if the bill size is above Tk. 1000. If the bill size is below Tk. 1000 the service charge of Tk. 50 will be applicable.